Art Laboratory Berlin Prinzenallee 34, 13359 Berlin. Sam Belinfante and Simon Lewandowski’s work The Reversing Machine (A Theatre of Kairos and Chronos) alludes to the notion of Kairos as opportune time, as opposed to Chronos, the course of time. The artwork is a constructed mechanism, which the artists call a Time-Setter or Chronocrator and which tries to examine temporal perception by means of running different machines forwards and backwards. This mechanical palindrom is an outstanding artistic reflection on our contemporary life with its many simultaneously controlled processes and repetitive actions. It is the first installation of what will be a constantly-changing and developing series incorporating sound, performance, sculpture and architecture. The Reversing Machine mechanism was designed and built for Sam Belinfante and Simon Lewandowski by Alastair Metcalfe and Myles Souter of Effects Too. 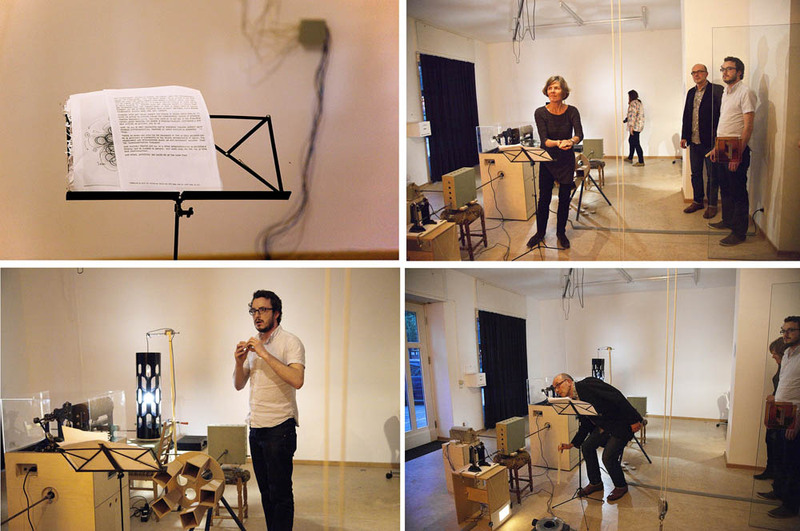 Works by Cage and others adapted for the output of the Reversing Machine plus new sound works by Sam Belinfante & Simon Lewandowski. In conjunction with the exhibition Fantastic Time Machines and our current series Time & Technology Belinfante & Lewandowski will perform a series of sound works and actions using the Reversing Machine mechanism and attached devices. *No.1:A Theatre of Kairos and Chronos. *No.2: The Reversing Machine as Creative DNA Mill. *No.3: The Physics of the Reversing Machine.